Brake Master Cylinder and Servo System parts suitable for the Land Rover Defender. Inc. VAT: £56.59 Inc. VAT: Info UK VAT charged at 20%. Ex VAT £47.16 Ex VAT Info Outside of EU and EU VAT registered companies only (not UK). Inc. VAT: £103.02 Inc. VAT: Info UK VAT charged at 20%. Ex VAT £85.85 Ex VAT Info Outside of EU and EU VAT registered companies only (not UK). Inc. VAT: £5.56 Inc. VAT: Info UK VAT charged at 20%. Ex VAT £4.63 Ex VAT Info Outside of EU and EU VAT registered companies only (not UK). Inc. VAT: £71.29 Inc. VAT: Info UK VAT charged at 20%. Ex VAT £59.41 Ex VAT Info Outside of EU and EU VAT registered companies only (not UK). 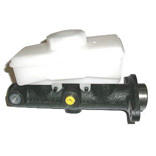 Brake servo - non ABS 90 to HA701009/110/130 to HA901219. Inc. VAT: £67.07 Inc. VAT: Info UK VAT charged at 20%. Ex VAT £55.89 Ex VAT Info Outside of EU and EU VAT registered companies only (not UK). Inc. VAT: £15.91 Inc. VAT: Info UK VAT charged at 20%. Ex VAT £13.26 Ex VAT Info Outside of EU and EU VAT registered companies only (not UK). Inc. VAT: £41.35 Inc. VAT: Info UK VAT charged at 20%. Ex VAT £34.46 Ex VAT Info Outside of EU and EU VAT registered companies only (not UK). Inc. VAT: £20.50 Inc. VAT: Info UK VAT charged at 20%. Ex VAT £17.08 Ex VAT Info Outside of EU and EU VAT registered companies only (not UK). Inc. VAT: £128.20 Inc. VAT: Info UK VAT charged at 20%. Ex VAT £106.83 Ex VAT Info Outside of EU and EU VAT registered companies only (not UK). Inc. VAT: £4.22 Inc. VAT: Info UK VAT charged at 20%. Ex VAT £3.52 Ex VAT Info Outside of EU and EU VAT registered companies only (not UK). Inc. VAT: £22.73 Inc. VAT: Info UK VAT charged at 20%. Ex VAT £18.94 Ex VAT Info Outside of EU and EU VAT registered companies only (not UK). Inc. VAT: £225.18 Inc. VAT: Info UK VAT charged at 20%. Ex VAT £187.65 Ex VAT Info Outside of EU and EU VAT registered companies only (not UK).